While some smoothly sail through their monthly periodic cycle, it can be highly, for the lack of a stronger word, agonizing for some. Sadly, the pain and discomfort don’t just stick to those selected days and start to bother for days, sometimes weeks, in advance. Along with bloating, constipation, cramps and borderline dangerous mood swings, there is indigestion, sore muscles and dizziness all of which end up affecting your daily activities. 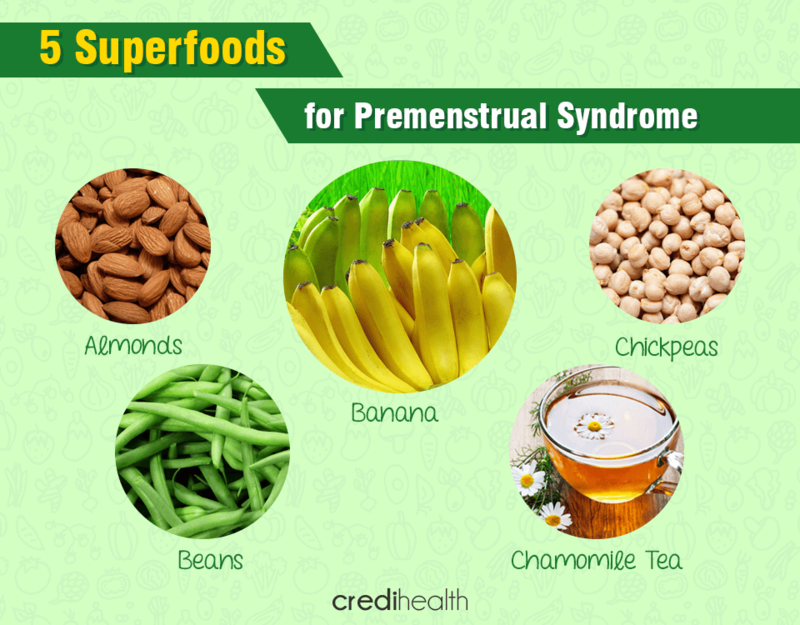 While there is still no scientific solution to this monthly cycle, there are a few superfoods that can reduce PMS symptoms. When sitting at home or (if you’re not that lucky,) in your office, cursing your uterus, Chamomile tea, could come to your rescue. Many different studies show that women who consume chamomile tea, experience milder versions of their premenstrual syndrome symptoms. While most gravitate towards hot beverages when PMS-ing, women ignore how badly coffee and caffeinated drinks affect bodies. Chamomile tea here becomes the perfect substitute as it will reduce PMS symptoms, both emotional and physical. Another superfood that helps to reduce PMS symptoms are beans. Beans are rich in magnesium, a mineral that helps in elevating water retention, which is the main culprit behind bloating, breast tenderness and abdominal discomfort. Also rich in anti-oxidants and serotonin, magnesium rich foods like beans also help with those mood swings and pain. Banana’s are cheap, easy to eat (no cutting, no folks, no washing of hands required!) and healthier than most munchies that you are nibbling on when you’re PMS-ing. A high source of Vitamin B6, which regulates blood glucose levels along with enhancing your mood, also help with the cramps and constipation, which again are bi-products of your impending monthly cycle. Now that it’s established that Vitamin B6 is a woman’s best friend to reduce PMS symptoms, another food that should be at the top of the list are Chickpeas. Being a powerhouse of fiber (the kind that lowers cholesterol) and magnesium and manganese, Chickpeas again help in reducing water retention and bloating, and of course, lowering mood-swings and irritability. A high source of Vitamin E, the vitamin that takes care of your skin (think of all the breakouts etc. when you’re about to have your periods), breast tenderness and high irritability levels, its high time almonds became a part of your diet. Along with providing the necessary fiber, almonds give the body an ample amount of zinc, potassium, phosphorus. All of these together help with those gloomy thoughts and anemia. So remember that the next time you want munchies in between meals! Get FREE assistance from medical experts to select the best gynecologist in India for your treatment.